I probably should have written more about BarCamp Indy between the first time and now, but, oh well. I certainly did plenty of word-of-mouth promotion to my geeky friends that might have been interested, so that's what matters. So yes, BarCamp Indy 2008 was today. A BarCamp is an “un-conference”-style tech conference. All content is presented by the participants and is usually scheduled on the day of the event. It's a very open and collaborative event. This was the inaugural BarCamp in Indianapolis and while I have never been to one before, I thought it was quite a success. We had 16 in attendance, one of whom drove a couple hours from South Bend to attend (I believe he said he left at 5:30am). Topics included: “Going Green with Technology”, “Linux Desktop: Making the Switch”, “The Future of Mobile Web”, “Graphic Web Design and CSS”, “Simplifying Your Life in Spite of Technology”, and “Information Strategy / Processing”. There was good discussion for all of these topics, and various links related to these can all be found on del.icio.us, tagged with 'barcampindy2008'. The presenters will be uploading their presentations and linking them from the BarCamp Indy wiki. I encourage them to tag these on del.icio.us as well, so they should show up on that same page above. Brad Williams used Ustream to stream live video of BarCamp. Ustream provides chat along with the video, so we had several people tune in and interact. Pretty cool. Most of us there are on-board The Twitter, of course. Between Scott Wilder, Brad Williams, and myself posting updates, I'm sure most of central Indiana Twitter people knew what was going on. Twitter is awesome, simple, has great uses and potential; I recommend it, even if it seems silly at first. Photos from the event can be found on Flickr, also tagged with 'barcampindy2008'. I think it was unanimous that this was a successful BarCamp, and I am sure there will be more coming. How soon, when, and where – that's all up in the air. I'm sure we will all start working that out on the wiki soon enough. Feel free to join in! P.S. 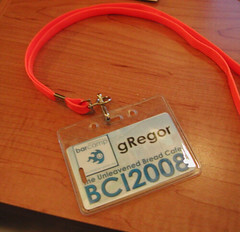 Check out our cool lanyards and name badges, provided by SnapFoo. Scott was cool enough to use my special capitalization. Next article: Two arms available ...ladies. This was first of it's kind of events, I participated in USA. It was great meeting new people and learning new things. Thanks all. Ah, I wish I had known more about it--I think I might have found it interesting, though I probably wouldn't have been able to go because of being busy. Sounds like a geektastic event! I need to start attending more conference things. Or just attend more outside-my-house things. It'd be fun to meet up with other people who actually know what Twitter is. And del.icio.us. And the internet. Love the name tag, by the way.